Vanguard Dividend Appreciation ETF (VIG) is an index exchange traded fund offered by Vanguard Group. Vanguard Dividend Appreciation ETF invests in US stocks. Known for its index mutual fund, Vanguard also provides vast selections of index ETFs for investors. Vanguard Dividend Appreciation ETF seeks to track the performance of the NASDAQ US Dividend Achievers Select Index (formerly known as the Dividend Achievers Select Index). It invests in stocks of companies with a record of growing their dividends year over year. The fund is passively managed by manager. 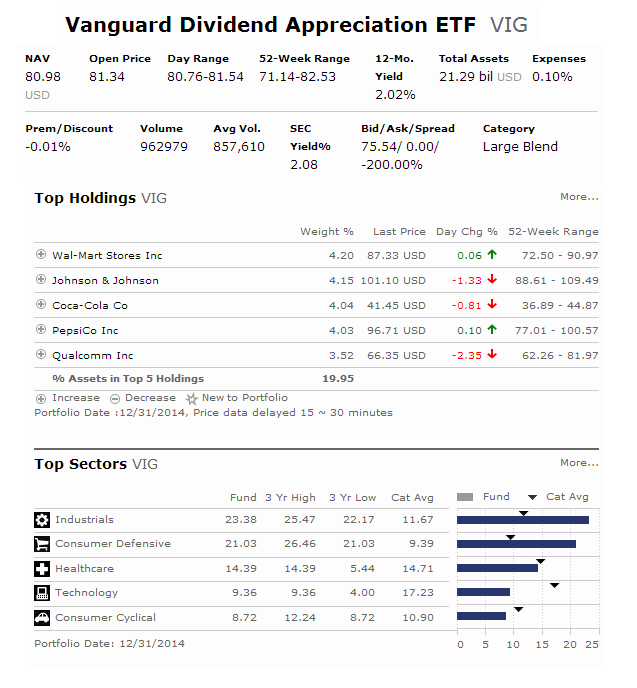 Morningstar has ranked this Vanguard Dividend Appreciation ETF with 3 star rating. In 2014, it has total return of 10.08%. This index ETF has returned 14.81% over the past 3 year, and 14.70% over the past 5 year. Top 5 stocks in its holdings are Wal-Mart Stores Inc, Johnson & Johnson, Coca-Cola Co, PepsiCo Inc, and Qualcomm Inc. Top 3 sectors are industrials, consumer defensive, and healthcare. This Vanguard ETF provide high yield for income. It also has a low expense fee.